Tim Henman will retire from tennis after Great Britain's Davis Cup match with Croatia at Wimbledon next month. The 32-year-old former world number four made the announcement at a news conference in New York. It brings to an end a 14-year career that included six Grand Slam semi-finals, one Masters Series title, and an Olympic silver medal in doubles. Henman will play his final Grand Slam event at next week's US Open, where he will open against Dmitry Tursunov. He will then try to help Great Britain beat Croatia in a vital Davis Cup encounter on Wimbledon's Number One Court on 21-23 September. "From a professional point of view, it's something I've been thinking about for some time," said Henman. And the former British number one admitted that ongoing back problems and the forthcoming birth of his third child had hastened his decision. "It's made my life a little bit harder, a little bit less enjoyable," he said of the back problems. "With our third child on the way, there's an even bigger incentive to be at home. It certainly gets harder and harder to be away from your family." He told BBC Sport: "I'm looking forward to taking a step back from the tennis life and spending time with my family. I'm sure that in the future, whether it's next year or the year after, I will look at the opportunities out there." 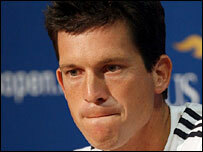 Henman also admitted that he was not tempted by the chance of a final swansong at Wimbledon next year. "I played some of my best tennis at Wimbledon and that's something I'll always be proud of. My record was good there but it was always a goal of mine to win the tournament," he said. "Am I disappointed I didn't win it? Yes I am. But when I reflect on my career, I was always able to maximise my potential.This was as good as I could have been." "After Wimbledon when my back didn't make the transition to hard courts well, that was when I sat down with my coach and looked at the calendar and it has all worked out well. "Playing in that pain and the problem in my back made it an uphill battle and one that was getting harder and harder to fulfil. "There's no doubt that the last year has been difficult with injuries but that's part and parcel of being a professional athlete. "For the level I've played and the things I have been able to achieve in tennis I didn't want to keep plugging away for the limited rewards it looked like I would be getting." He added: "For me to hang around for nine months just play at Wimbledon for the sake of it doesn't appeal. "I'm sure if I was asked, do I want to go back and play Wimbledon one last time? I really feel the simple answer is no." BBC tennis correspondent Jonathan Overend said: "It's been quite unpleasant sitting through some of his matches this year. His back injury has been clearly hurting him a good deal more than he was letting on over the last couple of years. "It's now the realisation that he's not getting any younger, the ranking is going in the wrong direction, and frankly, what's the point? "He'll miss the competition - it's a big part of his life that will now be completely vacant. "He has been ridiculed but one thing you can't deny about Henman is that he is so driven and has real competitive desire. "No-one could have got to number four in the world without that. When we sum up his career, he was limited as a junior and went on to be in the world's top four." But Henman is confident British tennis has a bright future, especially with the emergence of Andy Murray. "At the beginning of the year he was definitely playing top-five tennis and that was cut short by injury," he said. "With both Greg (Rusedski) and I going to retire, it's certainly an end of an era from that point of view. "I'm disappointed there aren't a big group of British players coming through but over the last 18 months things have changed at the LTA and that is exciting. "Hopefully the pieces have been put in place for the next generation coming through."